Binary Options ATM promises to make you money automatically and let you withdraw profits from an unlimited ATM. Don’t be fooled though, as Binary Options ATM is a scam. Let’s find out the hidden truths in our Binary Options ATM Review. Now let’s be honest – Binary Options ATM has perhaps one of the most unpolished websites for a binary software scam. I’ve reviewed more than a hundred binary software scams, and there isn’t one that looks as amateurish as this. However, this may be why Binary Options ATM is becoming one of the more successful binary software scams. We’re so used to seeing professional sales video that seeing something different triggers our curiosity to try it out a little bit more. Make no mistake – Binary Options ATM is still an internet scam, just like hundreds of others out there. Let’s find out the secrets Binary Options ATM is trying to hide from us. The sales video of Binary Options ATM pretty much relies on a single testimonial of a so-called beta tester who changed his life using the automated software. This man claims that he found out about Binary Options ATM from a friend and was introduced to the world of binary trading. He was so surprised that there’s a such a simple way to make a lot of money online, with little to no effort at all. He also claims that the software is free for now because it’s still undergoing beta testing. So if you want to get it for free, you better act now. Since this is the only testimonial in the entire sales material, his words put a lot of weight on the reliability of Binary Options ATM. Can he be trusted? Is he telling the truth? I hope he was, and I would’ve signed up for it in a heartbeat. Unfortunately, he’s just telling lies to get you to pay for Binary Options ATM scam. 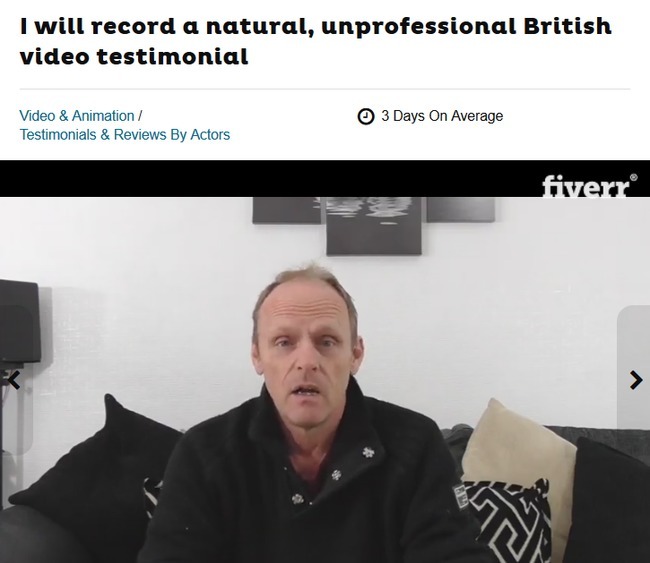 This “beta tester” of Binary Options ATM scam is actually a Fiverr actor, and his profile can be found on Fiverr here. Fiverr actors and actresses are paid to read the scripts of their clients like real testimonials. They’ll say pretty much whatever the clients want them to say, lies included. 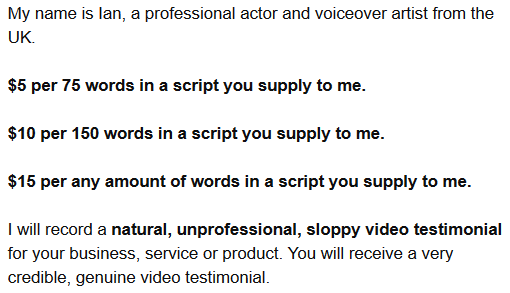 I’ve attached the description of the gig offered by this particular Fiverr actor here. Generally, a fake testimonial can be bought from Fiverr.com for just $5. Like what’s described by the actor, you’ll have to pay more if you need a longer testimonial. If Binary Options ATM is really as good as it claims, why is there a need to hire an actor and fake the testimonial? There’s only one reason – because the scammers behind Binary Options ATM is out to get your money, but their software doesn’t work at all. So the next time you come across internet opportunities that sound too good to be true, such as Binary Options ATM scam, stay vigilant and do some research. They are most likely scams. Since this is a binary software scam, we need to briefly talk about how binary trading works to make sure everyone is on the same page. If you already know how to trade binary options, you may skip to the next section. Binary options is gaining popularity in recent years because it’s very simple to trade. You only have to guess if the price of an asset will rise or fall after a short period of time, usually between 30 seconds to minutes. There can only be 2 outcomes – either you are right, or you are wrong (hence the name binary options). This is how it works – let’s say I think that the price of crude oil will rise after 2 minutes, and I bet $50 on a 2-minutes contract. When the time is up, and the price is indeed higher, I win a certain percentage of what I bet, usually between 60% to 80% (between $30 to $40). But if I’m wrong, I lose the entire $50 that I bet. In practice, trading binary options is not that different from gambling. There’s no way to predict the market movement in such a short period of time. Can you guess the outcome of a coin toss with confidence? Can you get it right consistently? No? The same principle applies to binary options. The chance of the market swinging in either direction is pretty much 50-50 given the short amount of time. Even if you manage a 50% win rate, you’ll still lose money due to the uneven winning vs losing payout of binary options. The difference in payouts is how binary options brokers make big money off the traders. Despite telling you that the software is free and that you will make a lot of money from it, Binary Options ATM has some secrets hidden in the disclaimer, after all. The link to the disclaimer can be found on the right side of their homepage as an orange button, but how many people actually click into it and read through the entire document? Despite coercing you to sign up for the software, you should not view Binary Options ATM as an invitation to trade binary options. If you do sign up, it’s entirely your own decision. Note: Scams like Binary Options ATM that promise exorbitant returns are illegal in many jurisdictions. If they do not include this clause, they are deemed to illegally coerce you into signing up for the scam. The profits shown in the sales materials are simulated results, no real trades have been executed using the software. To put it simply, any profits displayed are not real. These terms and conditions are not here to give you a fair warning as a consumer. The sole purpose of this document is to protect the scammers from legal actions when you lose all your money trading with Binary Trading ATM software. You can’t take any legal actions because you signed up based on your own decision. Why Are People Still Promoting Binary Options ATM? Now, this may not be the first review you’ve read about Binary Options ATM scam, and you wonder why are there so many positive reviews out there if this product is a blatant scam. Sadly, in some cases, the reviewers are swayed by the commissions and choose to endorse scams. Binary Options ATM pays $250 to its affiliates who successfully get someone to sign up for the scam. As an internet marketer, it’s inevitable that I endorse products as well, but I choose to recommend only products that genuinely help people. I could’ve written a raving review for Binary Options ATM scam and encouraged my readers to sign up, and I’ll earn a nice $250 commission once they deposit into their trading accounts. In fact, it’s a lot easier to write than to look for evidences to expose this scam. However, I’ve been a victim of binary software scam before and I don’t want my readers to end up the same. There’s simply no automated softwares that can make you free money. You need to put in time and effort to make money online. If you decide to sign up for Binary Options ATM, you’ll have to open a binary trading account through their sales page (which is an affiliate link). The team behind Binary Options ATM scam will earn a sum of referral fees as soon as you make your first deposit into the account. There are a few brokers to choose from, and their minimum deposit is at $250. You have to register for a brand new broker account even if you already have an existing account with your chosen broker, because the scammers behind Binary Options ATM scam cannot earn their referral fees if you don’t sign up through their affiliate link. And what happens when you finally deposit the money and lose it all using their automated software? You are left on your own and you cannot take any legal actions against the scammers, because it is already stated in the disclaimer that using the software is your own decision. 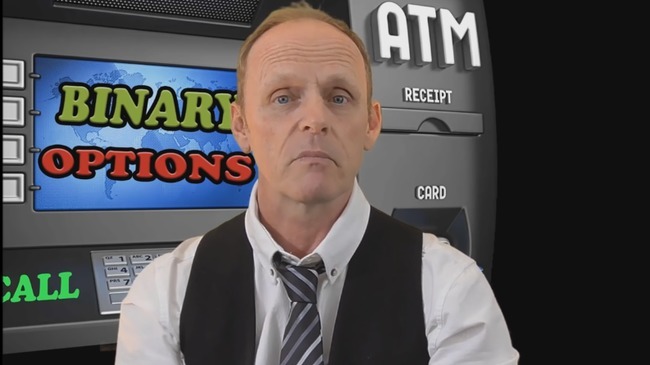 YES, BINARY OPTIONS ATM IS A SCAM. Binary options trading is not that different from gambling, and using an automated trading software is no different. You are essentially putting your hopes and entire investment in a piece of software that gambles on your behalf. 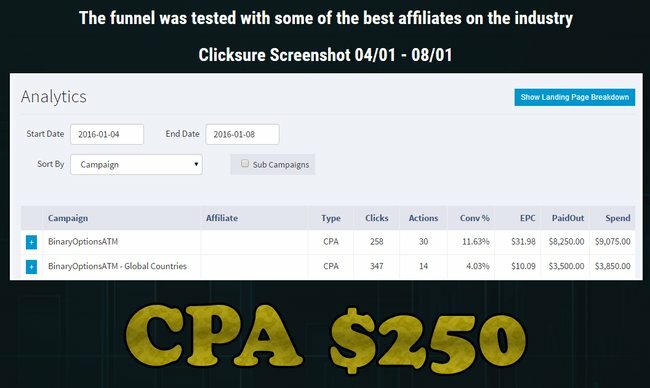 100% Profit Bot Review – Is 100% Profit Bot a Scam? Hello Edward, I just wanted to know if you reviewed Mike’s Auto Trader, that is very possibly the best acclaimed binary software out there. I haven’t reviewed Mike’s Auto Trader, I’ll put that into my review list. But exercise caution when it comes to binary trading software. I wouldn’t recommend putting any money into binary trading because the odds are overwhelmingly against you.